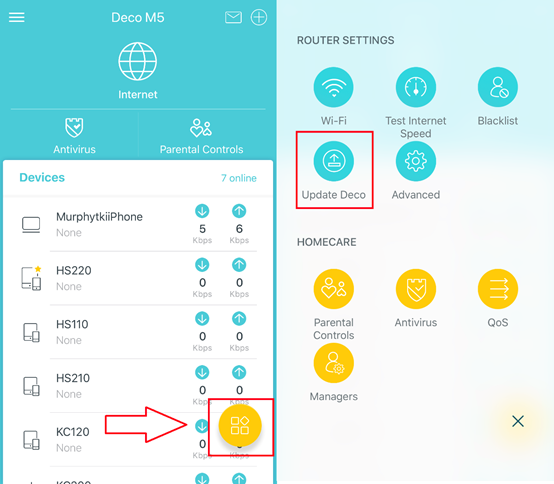 Under some circumstances, we have more than one Deco models (Deco M5, Deco M9 Plus, etc) in hand and want to use them together in one network topology. 1. If we have more than 2 Deco P7 units, and want a powerline backhaul network, choose Deco P7 as the main Deco. 2. It is recommended not to choose M4R as the main Deco if we have higher priority models. Choose a main Deco in the priority order below, then follow instructions of Deco app to set it up first. For example, if we’ve already set up a M5 network, we could also add new M9 Plus into the existing mesh network to extend our wireless coverage. Go to the App Store or Google Play Store, check and update your Deco app to the latest version. 2. Add M9 Plus into the M5 network. Tap here to add the M9 Plus unit. 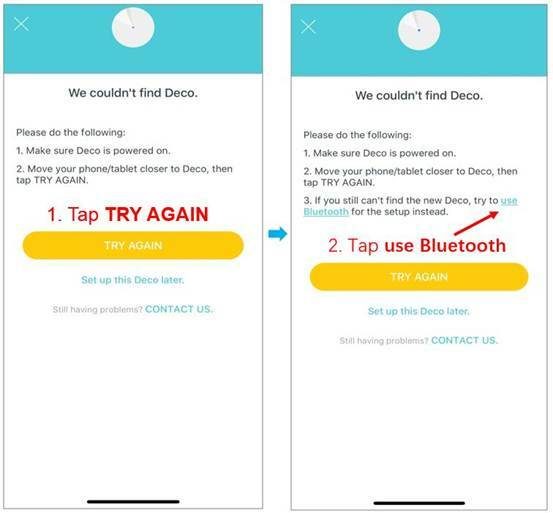 If you get stuck on “we couldn’t find Deco”, please tap TRY AGAIN. And a new option called “use Bluetooth” will appear. Tap the new option and walk through the steps to complete the setup. Find and tap the Settings icon in the bottom right corner, then click Update Deco. The app will search the firmware updates automatically. 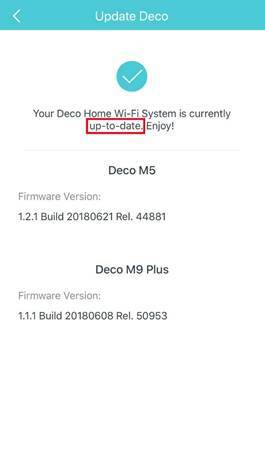 If a new firmware is available for Decos, please download and upgrade them through the Deco app. When the updates are completed, the app will remind that your firmware version is up-to-date. 4. Set M9 Plus as the main Deco. 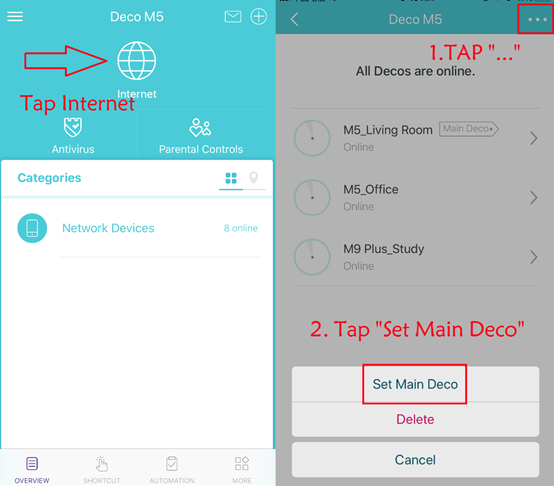 Make sure your phone is connected to the Deco Wi-Fi, then open the Deco app. On the main page, tap Internet. Then tap the “…” icon in the upper right corner, select Set Main Deco. Select the M9 Plus unit, and then click CONTINUE. 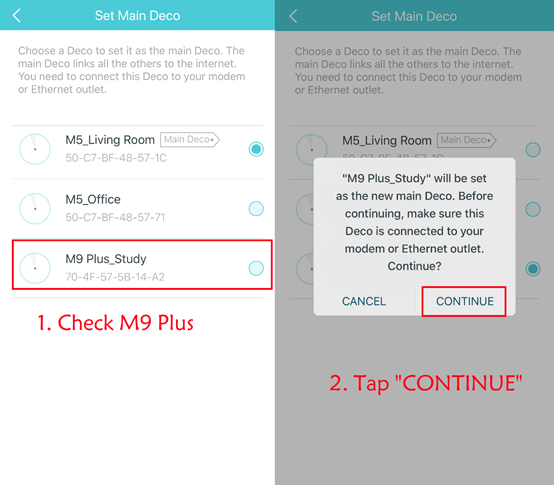 After that, please connect the M9 Plus unit to your modem or Ethernet outlet instead of the previous main M5 unit.